Once again I have been MIA and that is because I have spent most of my free time playing Guild Wars 2 (GW2) and the good news is that I now have the portal to the Heart of Maguuma and I am so excited. I have been testing the Open Broadcast Software recently since I plan to do a live stream when I play for whoever is interested in watching, I will make a follow up post as to where you can watch. Syafa and I were doing events in the Silverwastes when I received it and he was already farming for it for how long. Hopefully he still gets one in time. I’ve read posts in the GW2 forum that other players even received multiple beta portal stone drops which I don’t really understand why it should happen. A glitch maybe? I haven’t received an email yet or any further news other than what I know so far. It appears that the selected closed beta participants will be notified by email at a later date. I might be over thinking this but could it be possible that I haven’t successfully signed up? 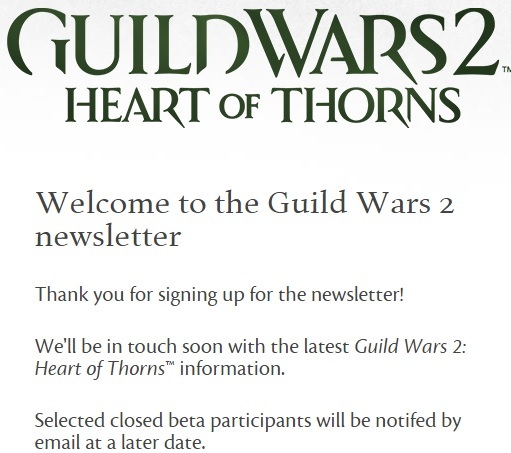 If anyone can shed some light as to whether or not I successfully registered in the newsletter because I haven’t received an email regarding HoT nor GW2 in general and I am starting to worry. I would really appreciate it. For now, back to gaming.